A member of the Air Force Academy Band at a concert in 2018. Photo/USAF. Celebrate America with The United States Air Force Academy Band as they kick off the 2019 Fred concert season on Sunday, April 7. This family-friendly event will be free to the public and will feature performances ranging from patriotic favorites and traditional marches to concert works and Broadway classics. The United States Air Force Academy Concert Band proudly represents the Air Force Academy, the leading institution for educating, training, and inspiring men and women to become officers of character. The Concert Band is composed of 40 active-duty Air Force professionals and is one of nine Academy Band ensembles. In addition to performing for Air Force troop morale, recruiting, and community outreach events, the group often appears on radio and television broadcasts and presents educational performances and clinics at national music conferences. 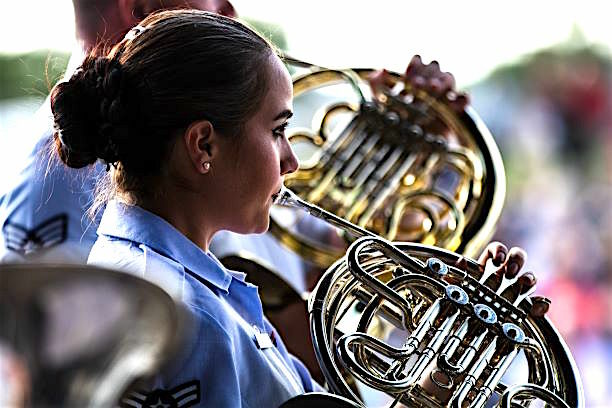 For more than 60 years, the Academy Band has used the power of music to honor our nation’s heroes, inspire Air Force personnel and the nation they serve, produce innovative musical programs and products, and communicate Air Force excellence to millions around the world. The United States Air Force Academy Concert Band appears on behalf of Lieutenant General Jay B. Silveria, Superintendent, United States Air Force Academy. Gates open at 2:00pm and the show will begin at 3 p.m. on Sunday, April 7. This is a free event, and tickets are not required for admission. The Fred’s 2019 concert season would not be possible without the support from our amazing sponsors which include Butler Lexus of South Atlanta, Belgard Hardscapes, SMC3, GoodSense/Perrigo, Amcor Specialty Cartons Atlanta, Rinnai, and Kiewit. For more information about the Fred, visit www.amphitheater.org.